Folks in the FOSS camp tout OpenOffice (OO) as an alternative to Microsoft Office (MO). The basic argument is that OO, for most uses and users, is every bit as good as MO, but without the high costs of MO. They further like to point out that most documents transfer back and forth between OO and MO, allowing for some degree (YMMV) of interoperability. There's some truth to those arguments, but here's another: to achieve interoperability between OO and MO, you will also give up a good degree of higher quality on the MO side. I define quality here as interoperability between complex objects in documents, and the rendering of said complex documents. Here's an example of where OO fails to match the quality of MO. The majority of my complaints about OO center around Impress, the PowerPoint alternative. Unless the slides are very simplistic in composition Impress does a poor job displaying them, especially if there were first created by PowerPoint. 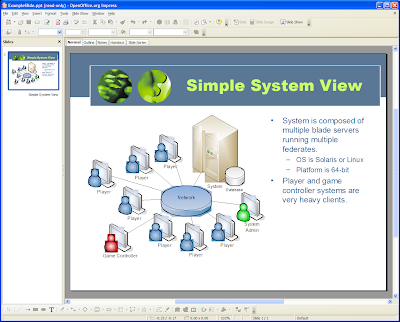 In the following examples I've create a simple example slide that includes an embedded Visio drawing. This is typical of how I, and many others I work with, use Microsoft's Office applications. OO 2.1 was used for this comparison, and OO was installed side-by-side with MO on Windows XP. Here's the basic example slide. 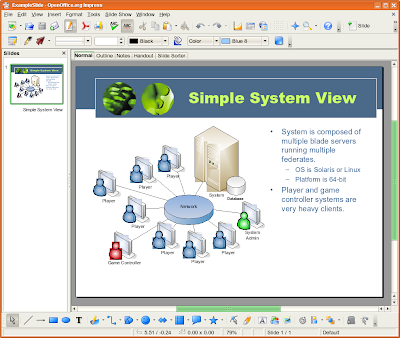 The graphic in the middle was created by Visio, and is embedded in the slide using OLE (I can still use that term, can't I?). The nice thing about embedded graphics is that double clicking on them opens the associated application within PowerPoint. 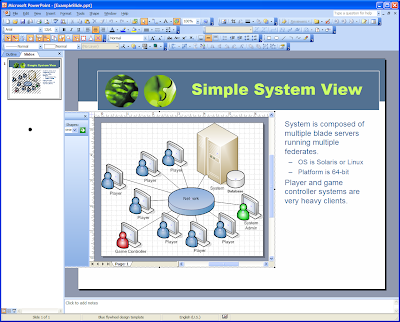 I initially create the graphic within Visio and then copy-and-paste it into PowerPoint, preferring to do any clean-up within the slide itself. And here's how OpenOffice renders the slide. I found it remarkable that it could render it at all, but it's certainly not good enough for presentations. The idea that I should 'dumb down' the content by inserting an image of the graphic instead of the graphic itself isn't a reasonable solution. Since the majority of the people I work with can see the MO slide with the Visio embedded image (with or without Visio installed), I have no real incentive to go to the extra steps (and trouble) of making it more cross-platform as it were. And I make no apologies. 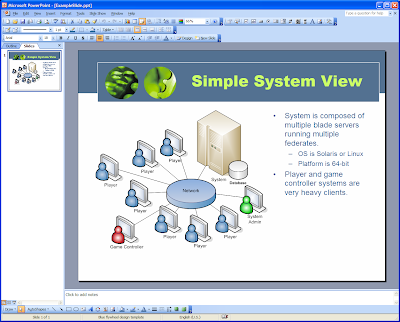 I offer, as a final example, the same slide being displayed in Imprise on OpenSuse 10.2. It's OO 2.0, not 2.1, but the issue is still the same on Linux as on Windows. This may surprise you, but much of the world doesn't use Visio and could care less. I use Dia on linux and I can't embed it as an 'Active X' object in Power Point. I'm not blaming Ms Office. If Active X objects is your thing go ahead use it. But don't blame Open Office because Microsoft has a patent on it's embedded objects and doesn't make a plugin for Open Office. If you choose to be locked in to Microsoft so be it. 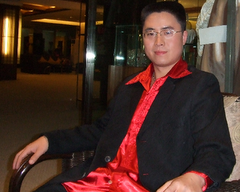 Our company has found much cheaper alternatives. There are many countries where the price of Visio alone is a years wages. So keep on paying and the Open Source community will continue to develop alternatives that anyone can use. Gee, you are saying the quality of the OOo rendering is not up to snuff. But then your real complaint is the the embedding gets lost. That's not the same. Is there really a difference in the rendering of this complex graphic? I can't see any, but I'm looking at images in the first place. P.S. : May be I'm biased because I work on OOo projects but I actually love to see differences and be knowledgeable about it. It motivates me to do a better job and demand more.